A classic french toast recipe with vanilla, cinnamon and a cream cheese glaze drizzled on warm toasted artisan bread slices. I mean, do you really like breakfast– at breakfast time? Or, are you the type that likes a cozy breakfast meal later in the day? Here at my house, we L.O.V.E breakfast in the evening! You wouldn’t believe the excitement when I go the lazy route and make breakfast for dinner, instead of using that pot roast that didn’t make it to the crock pot earlier that day. Needless to say, my family is simple to please! Sometimes. Whether you enjoy eating breakfast for breakfast, lunch, or dinner… you’ll be in French Toast Bliss (it’s what I call it!) 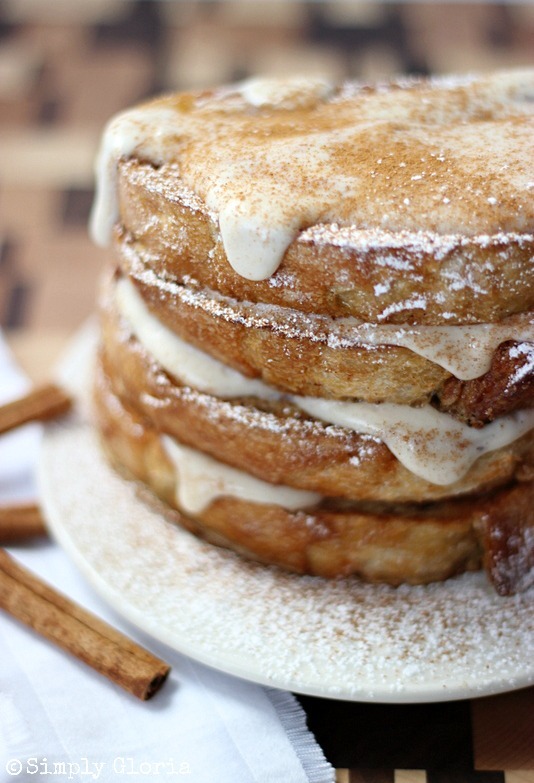 with just one bite of this Cinnamon French Toast with a Cream Cheese Glaze drizzled all over! And, topping the warm toasted bread with a glaze made up of cream cheese, more cinnamon, nutmeg, cream, and vanilla! Cream all the ingredients together for the glaze, in a medium mixing bowl. Set aside. Heat a large skillet or frying pan on medium to high heat. As the skillet is heating up, prepare the egg mixture for the bread. In a wide medium mixing bowl, combine the eggs, heavy cream, cinnamon, nutmeg, and vanilla. Whisk until all combined. Dip each slice of bread into the egg mixture. (No need to submerge each slice of bread all the way, just enough to coat each side. Not the crust.) Lay onto the heated pan with butter. Flip when golden brown. Spread a spoonful of the cream cheese glaze onto each slice of hot french toast. Sprinkle with powdered sugar, optional. Enjoy! Recipe may easily be doubled. Store and refrigerate cooked french toast and cream cheese glaze for up to 3 days. May individually wrap and freeze already cooked french toast for up to 3 weeks. I hope you enjoy these, as much as my family does! « Show Stopper Saturday Link Party, Featuring Cupcakes! Such a classic Gloria!! Love the cream cheese glaze idea! Makes it even better 😉 totally a breakfast person but I must confess I don’t often make it for dinner and I don’t know why!! Well, I make egg scrambles but that doesn’t count haha! I totally am going to give these a try. Thanks for sharing! Hope you’re having a lovely Wednesday! Kelly, scrambled eggs totally count! We have those all the time for dinner… quick and easy! Have a great night! I am a breakfast food lover but not actually for breakfast, unless it is on the weekend because it is not at 7:30am! I could dive right into this one! This looks divine! I would so love it for my breakfast! Christine, cream cheese seems to be a great friend, right?! It just goes with almost everything! Connie, it’s actually one of the favorite parts about what I look forward to the weekend! I LOVE breakfast! It’s my favorite meal. And I can totally go for breakfast in the evening. We have “dinner breakfasts” quite a bit. I need to make this french toast for one of those meals. It looks absolutely gorgeous Gloria! And I love that cream cheese glaze! My boy just commented the other day that it has been a while since we had breakfast for dinner and I was not sure whether to take that as a compliment or not…really you miss my laziness? Or you not happy now I’m making dinner every night hhaha! I love this french toast and how fancy it is. I will have to surprise him with it. Zainab, you are hilarious! I wouldn’t know how to take that either… hehe!! 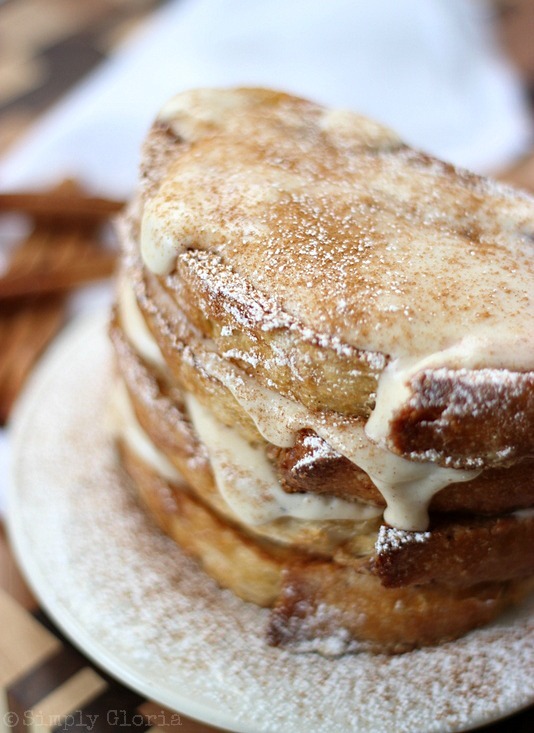 Oh my gosh, Gloria—It’s 9 pm and all I want to eat right now is a big stack of this french toast! Just in love with that drinkable-looking cream cheese glaze. My family loves breakfast for dinner as well—it’s just so much fun! Wow, delicious! I love the cream cheese glaze! Marcie, love it! You crack me up! EEEKK!! It’s like a layer cake, but with French toast! I love! Breakfast for dinner is the best!! 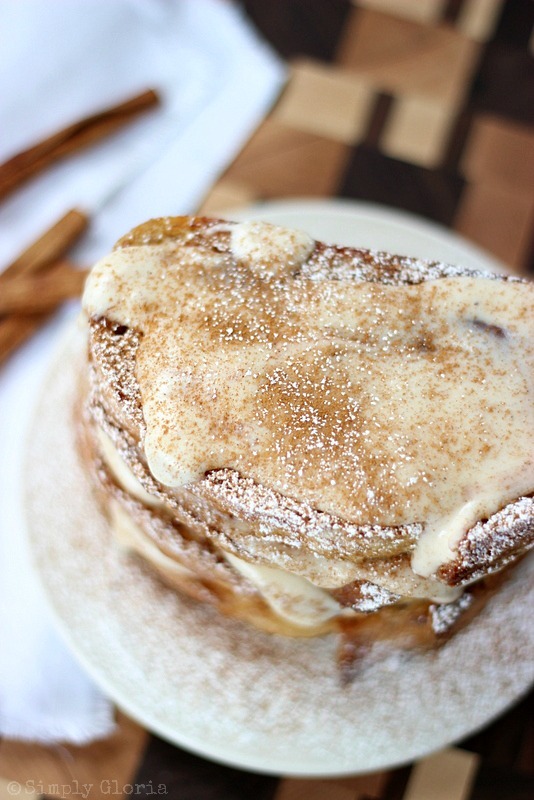 And this French toast – omg. It looks AMAZING!! That cream cheese glaze looks so incredible! Pinning! Our family is huge on breakfast for dinner. Never have I thought of making French Toast though – what a fabulous idea. This will definitely go on our menu plan this week :). And the cream cheese glaze? I am practically dying over that deliciousness. Ah-mazing! I am a breakfast person and a sweetbread person. So if you can combine the two, I’m all yours! This looks like the perfect french toast to serve for a special occasion, like Christmas or Easter. Would love for you to share at Fridays Unfolded! Alison, love special occasion breakfasts. 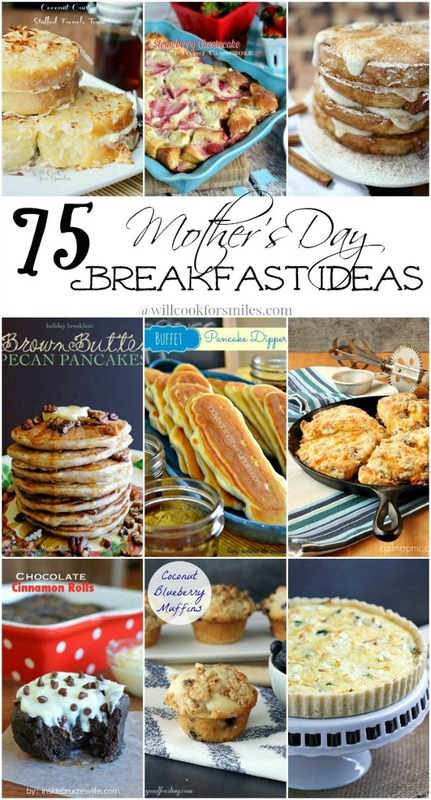 Especially Mother’s Day breakfast/brunch… my fave! Thank you for coming over to leave such sweet words! Breakfast for dinner is my favorite! 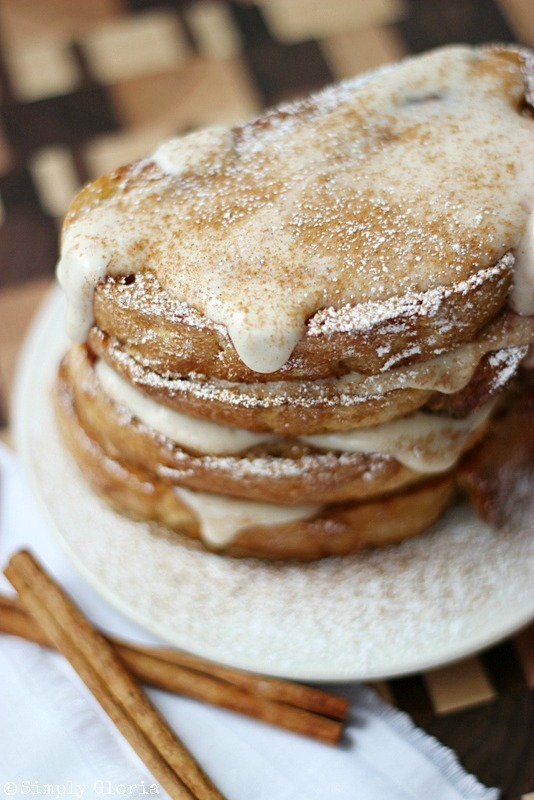 Love this recipe Gloria, especially with the Cream Cheese Glaze… OMG your killing me smalls! Pinned! Tina, this would go great with the french bread your hubs makes! Gloria, my jaw seriously DROPPED when I saw that first picture. Oh my WORD, woman! Unreal. Gorgeous, gorgeous, gorgeous, and so scrumptious I’m sure. Pinned! Allie, you just made my whole day… thank you! My family is a breakfast for dinner type! And oh my goodness, they LOVE their French toast. It isn’t my personal favorite, but I now know that is because we’ve never used hefty slices of French bread … or smothered it in cream cheese frosting … or piled five on a plate. I’m set now! And P.S. totally impressed with these photos – breakfast dishes like pancakes, waffles, and French toast are so hard to photograph! Mary Frances, thank you so much! I have to agree with you about photographing foods like this. I was starting to think, how many more times can I seriously photograph this without really moving it into another ‘pose’ … hehe! This has to be the best french toast ever, looks gorgeous and all the flavors! I love occasional pancakes for dinner, but this I could have every day! I can’t even. I’m in love. Pamela, you always make me smile! Good gosh, girl! I’m totally drooling over this French toast of yours! Your photography here is just so stunning and inviting. How something so simple can look so magical in the morning (or evening) totally amazes me. Pure deliciousness and, yes, bliss! We are big breakfast fans at our house and enjoy brunches on the weekend and breakfast for dinner treats now and then, too. Thank you for sharing, girl. Pinning (of course)! Ok, so I’m not really a breakfast person … but I am totally reconsidering that stance after seeing this!! Hubba hubba! Gloria, I could eat this anytime of the day! I wish you would come to my house and fix it. I looks to DIE FOR!! Marti, I wish we were neighbors! We’d be creating all day, together! Marti recently posted…Amazing Recipes To Try This Week! Yep, I love to sew! Looks like I’m going to put going to the fabric store on my list this week. Purely addicted to fabric! This is one amazing breakfast, Gloria! Thank, Lyuba! You’ve inspired me with all of your amazing french toast creations! Oh, I’m so glad you decided to come share this delectable dish at Fridays Unfolded! Alison, thank you for the invite! Love your site! We simply love breakfast for dinner too. Usually I prefer it that way. This looks like an awesome version of french toast. Pinned! Samantha, that is so sweet of you to say… thank you!! Oh so you want to make a gal drool, do you? Heh, well you succeeded at that! This French Toast looks TO DIE FOR, Gloria! Pinned! Thanks for the pin action, Julie! Thank you, Kelly! It’s a fun and delicious recipe… especially when my fam keeps requesting it every weekend! Have a great day! Yes to breakfast all the time! I am not a big maple syrup lover right now for some reason but cream cheese glaze I’d be all over that. How delicious! Jamie, I’m with you on the maple syrup thing… sometimes I can’t even fathom the smell. Hope you’re enjoying your weekend! Pinned. Can’t wait to try. Thanks, Patti! Hope you’re enjoying your Sunday! I have to admit, we are not big breakfast people… usually it’s just a yogurt on the go. But these… these are getting my blood pumping! They look crazy amazing!!! Oh. My. Gosh! I am completely drooling over this french toast!! And we totally eat breakfast for dinner. This is SOOOO happening! I love sourdough French toast, and cream cheese glaze on top sounds over-the-top good! You have one lucky family, Gloria! Oh my goodness… this looks amazing! What a great flavour combination and love the idea of a cream cheese glaze, will be trying this recipe out. thanks for the inspiration! Thanks so much for the recipe! Made this for the family this morning (with pepperidge farm apple caramel bread) and everyone LOVED it. Thanks so much for sharing! Can’t wait to try the recipe! French toast is the best, but add in cream cheese and it doesn’t get any better! I’m so happy you love this! Thanks for your review! Made this recipe this morning….first time ever making french toast at home. It was a success and huge hit with the family. We used Challah Round bread instead and it was perfect! Not soggy at all! This is a great base recipe to start with. I can see customizing it to ur liking or adding in strawberries! Yum! Thank you!